It is the solution that runs across it all, that allows machines to engage with humans in a natural and contextual way – that makes AI valuable. Last year saw the hype around enterprise artificial intelligence (AI) reach its peak, with nearly every brand on the planet deploying an AI strategy. Companies spent money - a lot of money - on the promise of using machines to deliver better experiences to their customers and they learnt a lot in the process. After investing in multiple new solutions - a bot that can book your next salon visit, a bot that can order an Uber for you, or an application that can offer product recommendations – a key takeaway appeared to be that AI is not simply a strategy, it is a tool. Perhaps even more importantly, businesses learnt that AI does not add enough value on its own. It is the solution that runs across it all, that allows machines to engage with humans in a natural and contextual way – that makes AI valuable. At present, there is little inter-connectivity between most of the AI technology consumer’s engage with. Instead of knowing who you are by simply the sound of your voice, most consumers are not recognised in the first instance, and are identified as a new user every time they login to a new platform. Logging you in, authenticating you and knowing your history will be critical to create a high-end customer experience - and all this needs to be conducted seamlessly. PINs, passwords, security questions won’t cut it. Not for the customer of today, who expects exceptional and seamless experience, and certainly not in terms of data security. There is also a difference between a bot that can schedule a haircut and a virtual assistant that can address a complex question that can only be solved with two-way dialogue - for example “what is the best investment for my parents?” We can expect a paradigm shift, from bots with limited and frustratingly simple conversational abilities, to industry-specific virtual assistants that can tap into enterprise-grade AI to support meaningful and contextual conversations. Gartner is also predicting a change in our approach to bots and AI, with the global analyst house predicting the use of virtual assistants (VAs) in the workplace is growing. By 2021, Gartner forecasts that 25 per cent of digital workers will use a virtual employee assistant (VEA) on a daily basis. This marks a significant increase from the “less than two per cent” of workers who adopted the technology in 2019. The contact centre was seen as the “pilot and testing ground for many adopters of VAs” however “with the democratisation of artificial intelligence (AI)” and along with the development of other user interface technologies, Gartner predicts we’re set to see the use of virtual assistants exponentially grow. Context and anticipation are key to such deployments. Truly intelligent systems won’t just answer your request when you make it, they will know why you’re calling before you’ve even said anything. For example, a retailer will know - before you ask - that you have an order in-process and will provide, with accuracy, your shipping status and delivery timing. A travel and hospitality company will use AI and machine learning models to identify keywords within the context of a conversation, and offer suggestions based on your profile and previous interactions. Deploying new technology without demonstrating a positive return on investment has never been a viable option for CIOs, but against today’s wider economic backdrop, justifying investments has never been more critical. Companies will therefore start demanding more information, financial context and statistics on their investments in AI and the ROI they deliver. They will be looking for a more accurate way to measure AI’s impact on the bottom line and customer experience. This starts with the consideration of your unique data acquisition situation. What data do you have and what data can you get? What data do you not have, that you need? 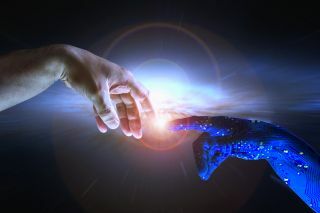 CIOs will look for new ways to leverage their existing AI investment by blending AI and human touch - identifying where AI can support humans in their daily roles, and when to transition from a machine-driven interaction to a live person for a better outcome. Enterprises in the ‘age of AI’ must now re-imagine the way they work, as AI can fundamentally change aspects of how things are done. For example, in the pharmaceutical industry, where traditionally nine out of ten candidate drug therapies fail and billions of pounds are spent, deep learning can be used to identify disease characteristics and patterns, which leads to new treatments or finding new drugs faster and more cheaply. However, organisations must keep in mind that AI is not yet at the level of human understanding – nor will it be for quite a long time. That’s why humans working alongside machines is still the most effective methodology for success. A group of researchers from Beth Israel Deaconess Medical Centre (BIDMC) and Harvard Medical School (HMS) found that in breast cancer detection AI is 92 per cent accurate and human pathologists are 96 per cent accurate. Both impressive numbers. But the two working together produces 99.5 per cent accuracy in tumour detection. That level of understanding is invaluable for cancer patients. Technology and human consciousness are truly better together. For example, when automating a customer engagement programme through AI-powered chatbots - virtual assistants or IVR - true customer satisfaction cannot be reached without the option of being redirected to a human agent when needed. Today, technology is also capable of leveraging machine learning to increase the conversational intelligence of virtual assistants (VAs) and chatbots. In contact centres, technology is capable of creating more human interactions by reading existing chat logs and transcripts of conversations between agents and customers, and automatically building highly effective dialogue models used to support two-way conversations between virtual assistants and consumers. Until now, training a virtual assistant to specialise in any specific industry has been manual, time-consuming, and prone to human error. Yet by combining humans with AI, we have reached a point in which AI can change the game for employers, fundamentally change how we do business and drive a positive ROI. The bottom line; if you’re still asking how to deploy more AI today, you’re asking the wrong question.